Quality brass mouthpieces contribute to the high regard Yamaha has earned among beginning and professional musicians alike. The result of a special approach to design and manufacture, Yamaha mouthpieces deliver the performance and comfort required where they are needed most: where instrument meets musician. The mouthpiece production technique used by Yamaha promises consistent quality mouthpieces, time after time. Other manufacturers use a specific cutting tool to create every mouthpiece, which causes problems as tools start to wear. This can result in inconsistent quality and poor performance. Yamaha´s use a computer-aided design system and computer controlled lathe to work together to produce the most precise, consistent mouthpieces in the world. Same rim configuration as the 16C4 trumpet model, thus interchangeable. Ideal for orchestra players who prefer a large inner rim diameter. 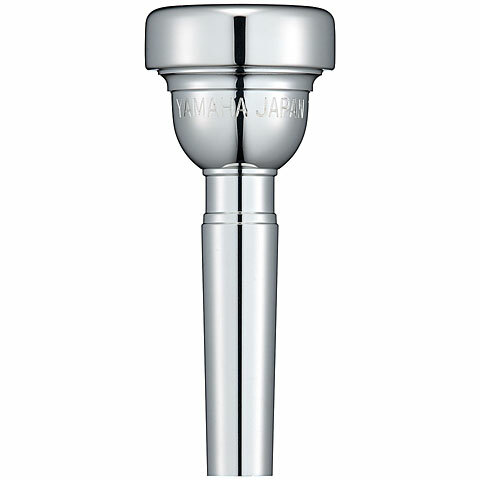 Yamaha standard series mouthpieces are manufactured using the most advanced technologies and are characterised by precision, smooth response, secure control and easy playability. They have the ideal weight for all-round use and are available in many different sizes so that each player can find his mouthpiece.